Wally Pfister's "Transcendence" has an interesting first 20 minutes. Stylistically, it looks molecular: drops of water, strands of hair, circles of light, natural, malleable entities, are often glimpsed in close-up. Transformation is hinted at. It's an immersive atmosphere. Unfortunately the film itself seems to split like an atom into several disparate pieces. 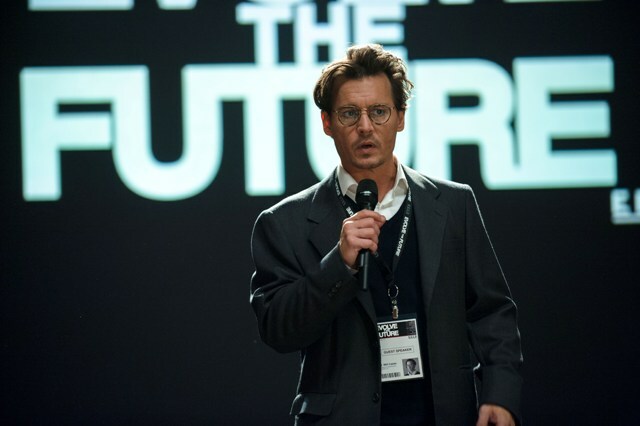 Dr. Will Caster (Johnny Depp) is renowned for his work in artificial intelligence. He believes human beings and their intelligence can be enhanced through machines. Evelyn (Rebecca Hall) is also a doctor who studies artificial intelligence. She and Will are married, and married to the cause of fusing machine capacity and technology with human emotion and thought. PINN, a mammoth sophisticated computer system network who sounds like Siri, looms, though not a malevolent machine like HAL. "Transcendence" has very early promise but the film fizzles quickly into a standard cautionary sci-fi tale that devolves into a techno-zombie drama and "Lawnmower Man"-type scenario: what happens when the best of intentions turns disastrous? Mr. Pfister gets that question answered on an obvious, elementary level but the biggest issue in the film is Will himself. What does he really want? Will is the looming enigma of "Transcendence", a puzzling, troubled film. At times he is a gimmick, like Mr. Depp himself often is in other films ("Alice In Wonderland", "Willy Wonka", "The Lone Ranger", "Pirates Of The Caribbean".) Here, Mr. Depp's omnipresent Will looms and presides in campy fashion too. He's here, then he's there, then he's right behind you. And his stoic voice intones. Then Will is possessing someone. It's the Johnny Depp show, and it takes away from any little thing the film ever had going for it. Any semblance of a credible, thought-provoking drama becomes a silly, boring "comedy" without being funny. Evelyn spends her time shrieking and reacting to fear rather than consistently employing her common sense and the skills justifying her credentials and accomplishments. She's sidelined. A one-dimensional piñata. "Run away from this place", a handwritten note tells her at one point. Morgan Freeman has an odd voice over as if to validate Will and Evelyn's connection but he may as well have been the hallowed echoing voice in the sky reading the words from that handwritten note. An FBI character (Cillian Murphy) seems superfluous. Ms. Hall, Mr. Freeman and Mr. Murphy have all been in Christopher Nolan's films, and Mr. Pfister, who makes his directorial debut here, was the cinematographer on many of them. Those actors are in a scattershot film that doesn't know its identity or its real focus. Much of that is down to Mr. Paglen. For all of its visual effects "Transcendence" is remarkably inert and stale. It simply can't get out of its own way and holds some very good actors hostage. It's soupy, dank and confused. A New Agey music score is an uneasy balance with the menace of what is to come. Much of the time "Transcendence" doesn't know where its characters are, and nor did I. Are they in Berkeley, San Francisco, Los Angeles, New Mexico or another planet? I kept wanting "Transcendence" to become something but the film never comes close to transcending itself or realizing any potential it advertises. Also with: Paul Bettany, Kate Mara, Clifton Collins Jr., Cole Hauser, Zander Berkeley. "Transcendence" is rated PG-13 by the Motion Picture Association Of America for sci-fi action and violence, some bloody images, brief strong language and sensuality. The film's running time is one hour and 56 minutes.